Since 2009 the Office of Sustainability has collected and aggregated all the University’s Greenhouse Gas (GHG) emissions. The annual GHG Inventory is a record of sustainability progress and serves as the keystone of decisionmaking related to emissions reduction strategies. This diagram shows the University’s energy inputs, the activities those inputs support, and their associated greenhouse gas emissions. Low carbon inputs include energy from solar and hydro while high carbon inputs include oil and natural gas. Activities are divided into categories like building heat, lighting and plug loads, and air travel. Scope One (I) emissions come from energy generated by the central power plant for heating campus. In 2012 scope I emissions accounted for 40% of the University’s total emissions. Scope Two (II) emissions, which includes all other purchased energy, accounted for only 3% of total emissions. Emissions from University-related travel (Scope Three (III) emissions) made up 57% of total emissions. Reducing emissions from air travel and generating building heat remain the University’s most significant emissions reductions challenges. A major upgrade to the Central Power Station now allows it to produce most of the electricity for campus. This recent change is not yet captured by our GHG reporting. Using data from the Clean Air-Cool Planet’s (CACP) Campus Carbon Calculator™, the Office of Sustainability developed a powerful infographic to present the institution’s energy sources, consumption rates, and emissions data. 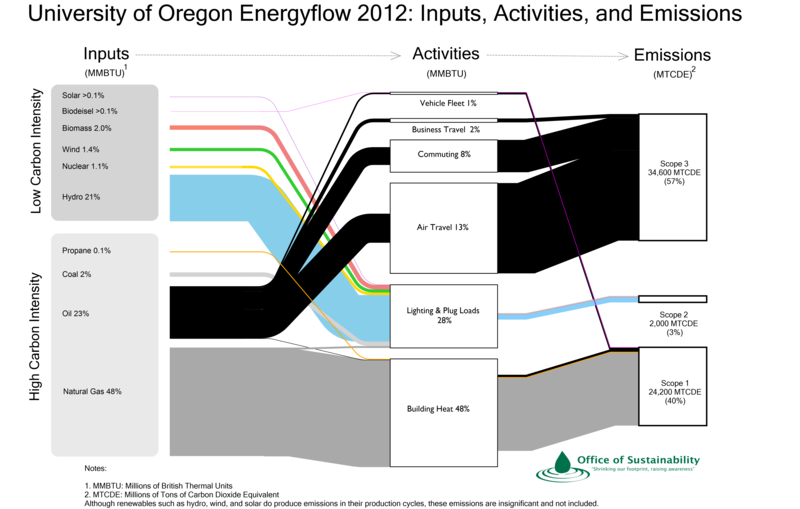 Since 2011, this infographic has become a cornerstone for communicating the UO emissions story. With other institutions taking an interest in the graphic, the office launched a pilot project in Flowchart summer 2013 to test the market. We have signed contracts to produce infogragraphics for two sister institutions in Oregon. The pilot—a partnership with UO’s Technology Transfer Services—is helping commercialize the tool and develop a new revenue stream to subsidize sustainability initiatives at UO.